Remember those old "There’s an app for that" iPhone commercials? "There’s a podcast for that" is the refrain of 2017. Whether you want to listen about politics, money, news, health, more politics, or spooky true crime stories, well, there’s a podcast for that. It’s only fitting that there are also podcasts revolving around the world of business, and even more fitting that it’s LinkedIn leading the charge with them. The social network for professionals has had a busy year, having been bought Microsoft in the summer of 2016, but it’s not just for finding jobs anymore. Its growing podcast network means that it also helps professionals excel in the jobs and industries they’re already in. Podcasts also have the benefit of being an easy way for professionals to absorb information. During a busy work day, it can be hard to find time to read a blog post or an email, and if you’re like many people you just find your Pocket filled with unread articles. But podcasts can be listened to while you’re working on something else or during a commute, and all you need is your smartphone. Podcasts let you keep up on the world of business, even when other mediums fail. Work In Progress, LinkedIn Speaker Series, and The Sophisticated Marketer’s Podcast are some of the best podcasts for business out there, and should be required listening for any professional looking to advance their career. Hosted by LinkedIn Senior News Editor Caroline Fairchild and Managing Editor Chip Cutter, Work In Progress (not to be confused with the Slack podcast Work in Progress) looks not just at news affecting different areas of business, but the broader trends that surround them. Described as offering "discussions with some of the economy’s brightest thinkers and on-the-ground interviews with workers around the U.S., all grappling with change," the relatively new series (only four episodes in as of this writing) has already tackled such topics as automation, universal basic income, and the challenges Walmart faces as it ramps up its physical retail presence as many storefronts are shuttered – all with interviews with real people behind them. Any professional wanting to keep up with the goings-on in their industry or beyond should subscribe to Work In Progress to ensure they stay that the top of their game. Failing that, at least follow Fairchild on LinkedIn so you get accompanying writeups (and other goodies). LinkedIn might be considered to be a glorified job board for some people, but for others it’s a way to more holistically advance their career by learning new skills and insights from experts from around the world. LinkedIn has helped enable that by allowing people to post their own articles to the site, and they’ve further nurture it through their Speaker Series, where top thought leaders speak at a live Q&A. ; Luckily, you don’t have to be in the crowd to reap the rewards of these talks. 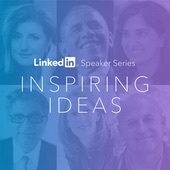 LinkedIn repurposes the Speaker Series not only by posting the videos online, but then by creating the appropriately-named LinkedIn Speaker Series podcast. They’re like TED Talks but without the pretension, and have featured such people as author Brad Stone, U.S. Senator Kirsten Gillibrand, and mogul Arianna Huffington. There’s no better place for a variety of viewpoints, anecdotes, and tips from some of the biggest names in the business world and beyond. 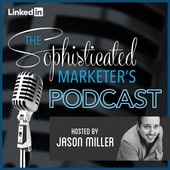 Some might immediately write off The Sophisticated Marketer’s Podcast, hosted by Jason Miller, Sr of LinkedIn Marketing Solutions, as not for them. After all, if you’re not a marketer, what’s the use of a marketing podcast? But to dismiss it so quickly would be a mistake. First of all, modern day marketing is intrinsically intertwined with other aspects of business. Understanding the basics of, say, search engine optimization can be useful in making decisions for sales, business development, customer service, and more. You don’t have to be an expert in it if you’re not a marketer, but it can help when you find yourself in a meeting. Second, The Sophisticated Marketer’s Podcast touches on much more than just marketing. Sure, Miller talks SEO, but he also talks to guests about public speaking, creativity, productivity, and more. Plus, there’s a lot of rock and roll in it – including episodes with Twisted Sister’s Jay Jay French – making it one of the more fun and engaging marketing podcasts. Whether marketing is a tangential part of your job, you’re just starting out in the field, or you want to learn how some of the best are approaching new techniques and technology, The Sophisticated Marketer’s Podcast has something for everybody.